OKT3 was the first murine monoclonal antibody to be introduced in clinical practice for both the treatment and the prevention of acute renal allograft rejection [1–3]. 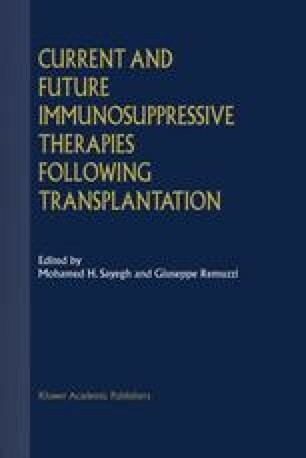 The initial rationale for these studies was the capacity of OKT3 to stain all mature peripheral T cells and to completely abolish both T cell proliferation and the generation of cytotoxic T cell effectors in in vitro mixed lymphocyte cultures . Interestingly enough, this occurred in 1981, few years before it could be firmly established that the specific molecular target of OKT3 was one of the polypeptide chains included within the major T cell recognition element namely, the T cell antigen receptor (TCR)/CD3 complex.